Please join us for this beloved J. Rickards summer tradition! 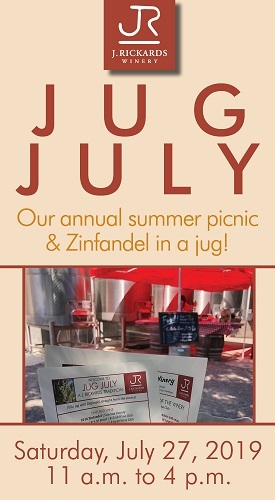 We'll be serving a fantastic lunch hot off the grill, featuring some of our favorite wines, and selling up our exclusive Zinfandel blend straight from the barrel into a keepsake jug! Stay a while and enjoy live music from Batacha Salsa Band. Wine club members, please ensure you're logged in and select the Jug July Wine Club ticket to get your discount!